In a moment of utter boredom with the dismal TV schedule the other night I found myself way down the TV station list watching “Challenge”, wallowing in nostalgia with 1980s game shows. There was “Celebrity Squares”, “The Price is Right” and “Supermarket Swoop” Those of you old enough will remember that it was all about winning desirable stuff (that most of us didn’t have enough of at the time). The prices were amazing! Over £400 for a 26” TV that extended dust gatheringly backwards as far as it was wide and over £10,000 for a phallus shaped Ford Coupe with a boot that would hardly fit a couple of suitcases let alone a full complement of garden waste and other stuff to the tip! It reminded me that we really were enthralled by consumerism, the acquisition of household goods and economic growth so that we could buy ever more stuff. It strikes me that we have now mostly got all the stuff we need to fill a house or could get hold of it cheaply second hand, or even for free through freecycle. We no longer get as excited by consumerism and economic growth. Perhaps we are even bored with it! However, I don’t think politicians have caught up. Can our economy really continue to “grow” in the true sense of the word? Can we continue to use ever greater quantities of the globes natural resources to get richer and richer. (This is the dream our mainstream political parties still seem to be selling.) Or should we using different metrics than economic growth to measure our happiness and sense of well-being.? A modern flat screen TV is a much better device than the huge 1980/90s versions. 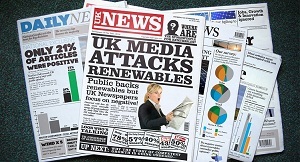 Plus it is considerably cheaper and uses less energy and labour both in its production and use. This is true of almost everything from cars to washing machines. Is the future about doing more with less? Living within our means and eliminating the UK deficit but feeling no poorer because we produce things and organise everything more efficiently. Can we use less energy, buy less “stuff”, use communications to work more efficiently from home, maybe even eat less, but feel no worse off? What people care about now is not continual accumulation of wealth (apart from an important minority on the breadline who need help pulling themselves up) but the feeling of well-being that comes from having decent, secure housing, a reliable NHS, good family networks, good food and drink. That’s why the coming election feels different. 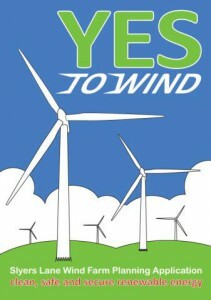 The two main parties are still focused on the aspirations we had in the 20th Century but the electorate has moved on. We are now mainly worried about maintaining what we have in a world increasingly threatened by climate change and massive migratory pressure. That revolutionary Russell Brand summed up the feeling of many by saying simply “Give us something to vote FOR.” The parties we need are those that understand what is shaping our future (ie different energy sources, how and where we build our houses, making people healthier, more efficient work practices, inward migration, social cohesion etc) and their part in making it better than it might otherwise be. Us rural types have always been better than average at living within our means. Husbanding scarce resources and managing the land so it is still fit to hand on to the next generation. We expect our politicians to demonstrate the same skill and understanding. "I just hope more of our stuff become like mobile phones in that they require much less physical resource and more intellectual property. Peoples retail therapy then uses human rather than the earth’s resource. " "Nice post. I agree with the writer on most points. But although our civilization is now able to meet the basic needs of most if not all people on the planet without further degrading the environment we still seem to lack the will to do so. Excessive profit at any cost is still the goal of many and humanity continues to waste resources by fighting meaningless wars. Our science and technology have given us the means to live comfortably and sustainably but we still have a ways to go philosophically. If the basic needs of the have-nots were provided would they be satisfied? Or must people have so much that they can no longer afford the cost of storing all their stuff to be satisfied? Here is the US people sure have a lot of stuff and yet $400 phones and $150 athletic shoes still fly off the shelves even though the new owners will almost certainly never use a fraction of the capabilities of those items. Each generations seems to want that which the prior generation had plus anything new that comes up. " On 1st June we have the warm up event in Hazelbury Bryan and I hope you will be able to join us. From 12:00 am participants will cycle a set 2 mile circuit around the village starting at the Antelope pub. You register outside the pub and receive your number to pin to your T shirt, put something in the charity box and do as many laps as you can with us. A volunteer will be keeping a count of your laps around the circuit. From lunchtime onwards there will be a barbecue run by Luke’s mum (your money for the burger going to charity) and from early evening the live music starts. After much persuasion, Not Made in China (Tiffany Wheaton-Green`s band) have agreed to make the journey up from Bournemouth with all their gear to play. They will be supported by a local band. The weather is forecast to be overcast with no rain. So good for cycling. Exercise, food and music. Complete sustenance for mind and body. 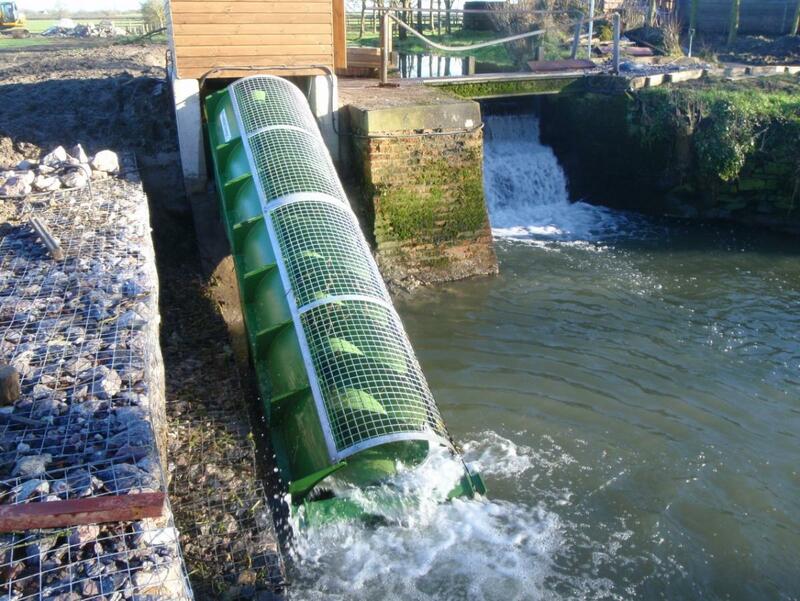 A 3.7 kW crossflow turbine has been installed at the end of the leat at Peggs Farm. There is a working 3.8 m diameter wheel also fed from the leat, which is still used to produce animal feed for the farm. The site is on the Fontmell Brook – a tributary of the River Stour – between Fontmell Magna and Child Okeford. The installation of this renewable electricity generation is estimated to generate 14,000 kWh/yr saving 6 tonnes of carbon dioxide a year and provides for some of the high electrical demand at this diary farm. 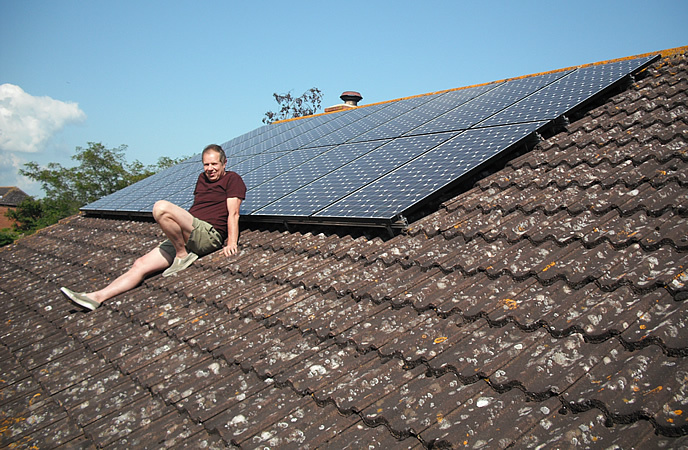 This farm diversification provides income to the farm from the Feed in tariff and sales of electricity. 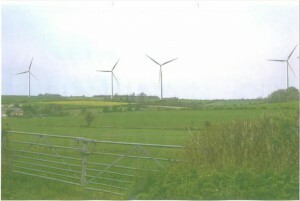 A crossflow turbine was chosen to match the head and flows and at this site. The rated flow of the turbine is determined by the 3.9 m head and flows available. 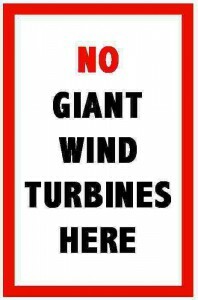 To comply with the Environment Agency Good Practise Guidelines, a 300 mm diameter turbine, taking a maximum flow of 0.120 m3s was chosen. The project included repair of leaks in the leat wall and construction of a new brick turbine house for the turbine, generator, grid connect and control unit. Extensive negotiation with the Environment Agency was required to ensure that the scheme design and methods of construction complied with the environmental standards expected to achieve the necessary Abstraction License and Flood Defence Consent. 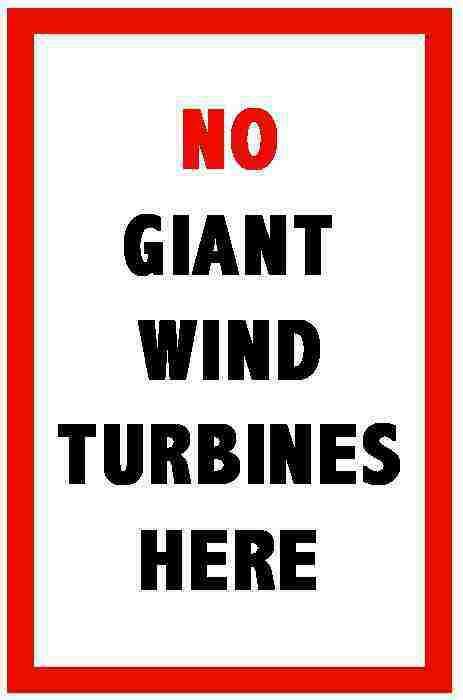 It was decided to install the turbine in a new lean-to building next to the existing mill where the wheel is located. The grid connection is arranged so that electricity generated supplies the needs of the site, only exporting to the grid when there is a surplus. The total project budget was £60,000. Sowing Seeds provided £21,807 but the process from initial agreement to receipt of the grant took 3 years. This is one of three hydropower projects in the area in receipt of the grant, all using different hydro turbine technologies. There are numerous old mill sites and other potential hydropower sites in Dorset. The Feed in Tariffs, sales of electricity and avoided import of electricity make development of these sites financially attractive. Project management is not beyond the scope of a talented amateur but the complexity of the design and license application process means that expert advice is usually required. It is intended (and required under the conditions of the grant received) that the project will be well monitored, documented and publicised to enable other Dorset hydro projects to learn from the experience gained in developing and maintaining hydropower at Peggs Farm. The project was developed with Potent Energy – find out more at: www.potenergy.co.uk. A 5.5 kW screw turbine has been installed next to the weir at Benjafield Farm. The site is on Shreen Water – a tributary of the River Stour – between Mere and Gillingham in Dorset. The installation of this renewable electricity generation is estimated to generate 28,000 kWh/yr saving 13 tonnes of carbon dioxide a year and provides for some of the high electrical demand at this cattle farm. This farm diversification provides income to the farm from the Feed in tariff and sales of electricity. 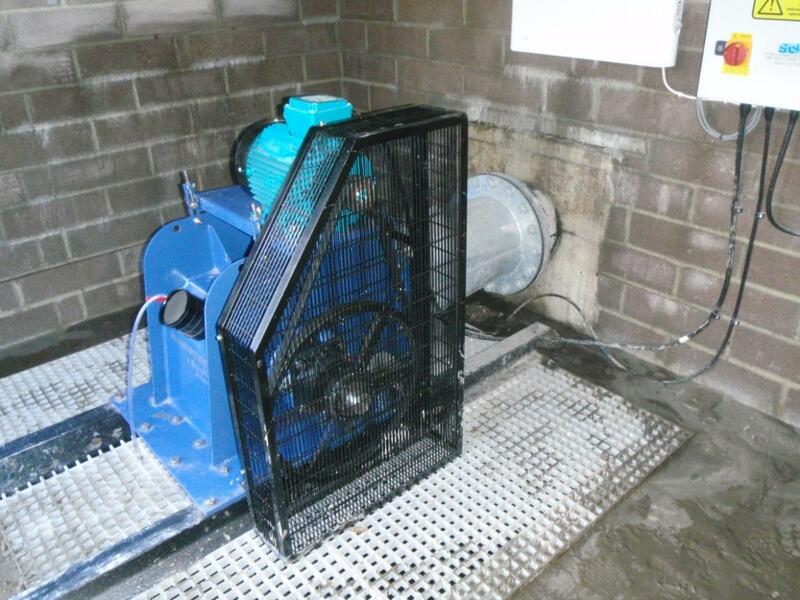 A screw turbine was chosen to match the low head, high flows and requirement for fish protection at this site. The rated flow of the turbine is determined by the 1.8 m head and flows available. 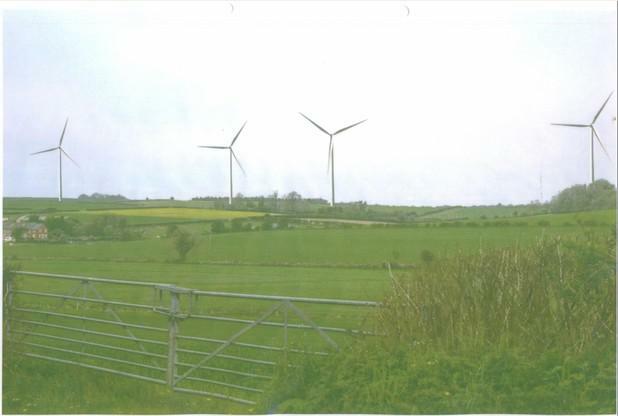 To comply with the Environment Agency Good Practise Guidelines, a 1.0m diameter turbine, taking a maximum flow of 0.320m3s was chosen. The project included stabilisation of the west bank and construction of a timber housing for the gearbox, generator, grid connect and control unit. Extensive negotiation with the Environment Agency was required to ensure that the scheme design and methods of construction complied with the environmental standards expected to achieve the necessary Abstraction License and Flood Defence Consent. It was decided to install the turbine in a new excavation next to the existing weir. A V shaped notch in the weir has been provided to enable down river fish passage. The grid connection is arranged so that electricity generated supplies the needs of the site, only exporting to the grid when there is a surplus. The total project budget was £70,000. Sowing Seeds provided £31,213 but the process from initial agreement to receipt of the grant took 3 years. This is one of three hydropower projects in the area in receipt of the grant, all using different hydro turbine technologies. There are numerous old mill sites and other potential hydropower sites in Dorset. The Feed in Tariffs, sales of electricity and avoided import of electricity make development of these sites financially attractive. Project management is not beyond the scope of a talented amateur but the complexity of the design and license application process means that expert advice is usually required. It is intended (and required under the conditions of the grant received) that the project will be well monitored, documented and publicised to enable other Dorset hydro projects to learn from the experience gained in developing and maintaining hydropower at Benjafield Farm. Is this a bad thing? There are a lot of us on the planet and most of us are having a pretty good time as compared to the “red in tooth and claw” existence of our distant ancestors going back millennia. Even our domesticated animals that we kill to eat have a fairly cushy existence until the time of their quick death. We have severely decreased biodiversity in farmed areas which now account for 40% of the world’s land surface but if we can protect most of the rest and the seas, maybe, just maybe, we can keep most of the world’s species and prevent the potentially catastrophic instability exhibited by degraded ecosystems. We have no choice but to manage the Earth as our own, for our own benefit. It is our evolutionary heritage that we strive to succeed in “feathering our nest.” With our English instincts, perhaps we should consider the Earth as a house and garden on a grander scale. We make it comfortable and pretty and micro manage the plants and animals, not just to provide us with food, but to show a pleasing mix of conformity and wildness. After all, most of us feel more at home seeing a green garden visited by birds than to see a concrete based storage area at the back of our house. It’s true we have some temporary problems switching from finite fossil fuel to the renewable energy hitting the earth in vastly greater amounts than we could ever need. And we need to wrest control of our population from nature (which will decimate our numbers if we get too far above ourselves). But perhaps we should avoid the doom and gloom expressed by some environmentalists and feel justifiably comfortable with our species achievement. What the Earth has achieved through evolving humankind maybe more significant than we have appreciated.